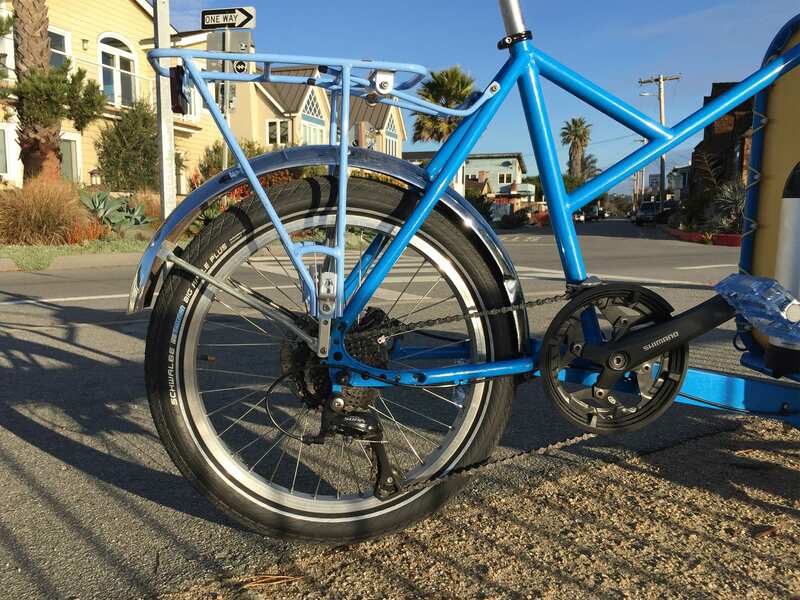 Schwalbe Big Apple, 20" x 2.15"
The Box Bike Collective is a community minded LLC based in Santa Cruz California designing electric cargo bikes. 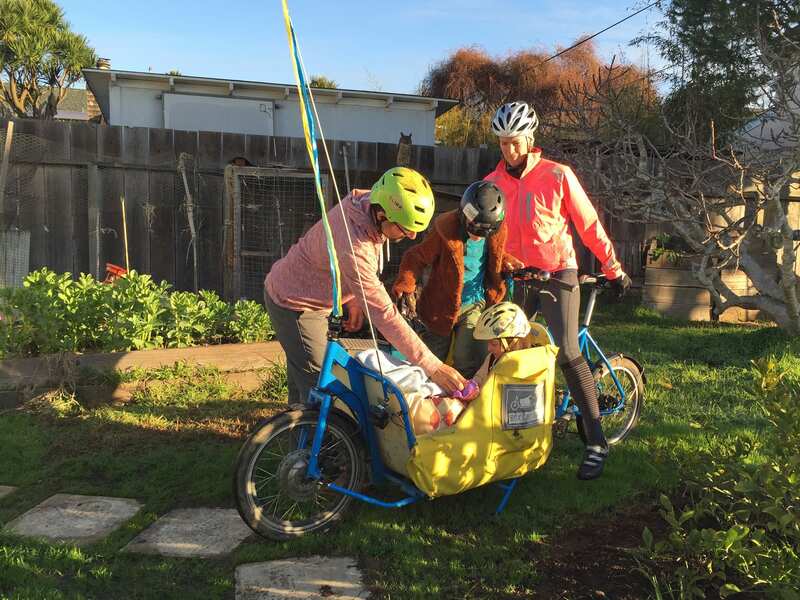 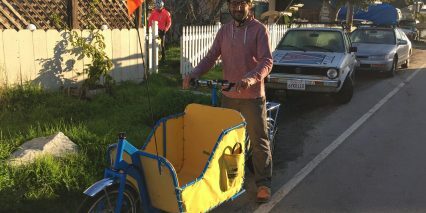 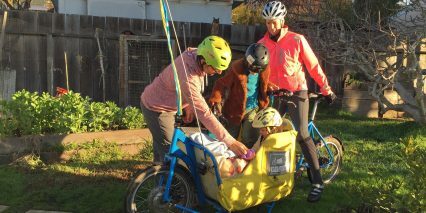 Their Standard Box Bike is the first model to be sold with free pickup or delivery in the Bay Area and so far the company has sold a hand full of these models and has launched a Kickstarter to build interest. 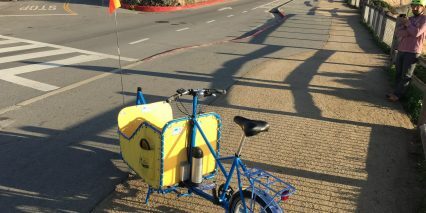 The plan is to continue selling direct and growing organically regardless of the outcome there. 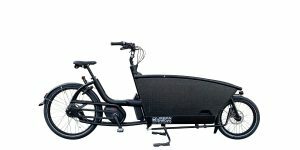 I was impressed with the unique mid-step frame design, which can accommodate short or tall riders thanks to an extra long seat post with angled seat tube, and the comfortable saddle and grips. 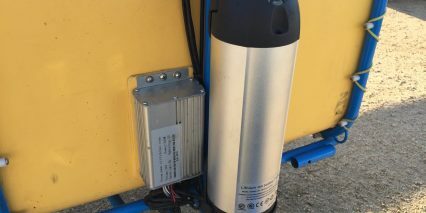 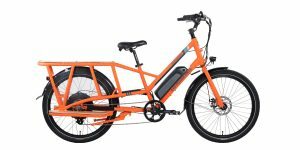 The bike is decidedly utilitarian with a generic battery pack, basic display panel and limited five sensor pedelec disc (many new bikes have 12 sensors for faster response) but it gets the job done and these trade-offs help to keep the price down. 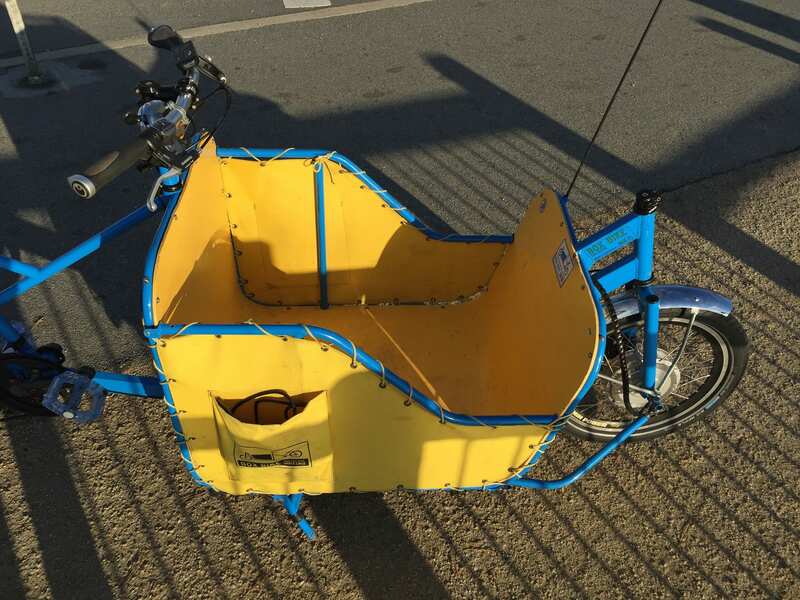 For $3,900 you get the custom steel frame, reinforced fork, upgraded Schwalbe tires with puncture protection and reflective sidewalls, beautiful chrome plated fenders, the basket with child seat insert, upgraded ergonomic grips and a comfy saddle. 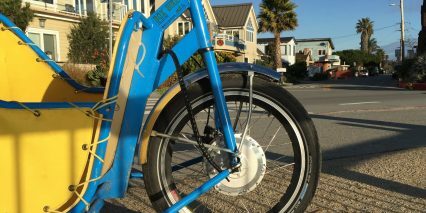 You also get to feel good knowing that you’ve supported the creation of a hand-built frame, local powder coating and canvas work. 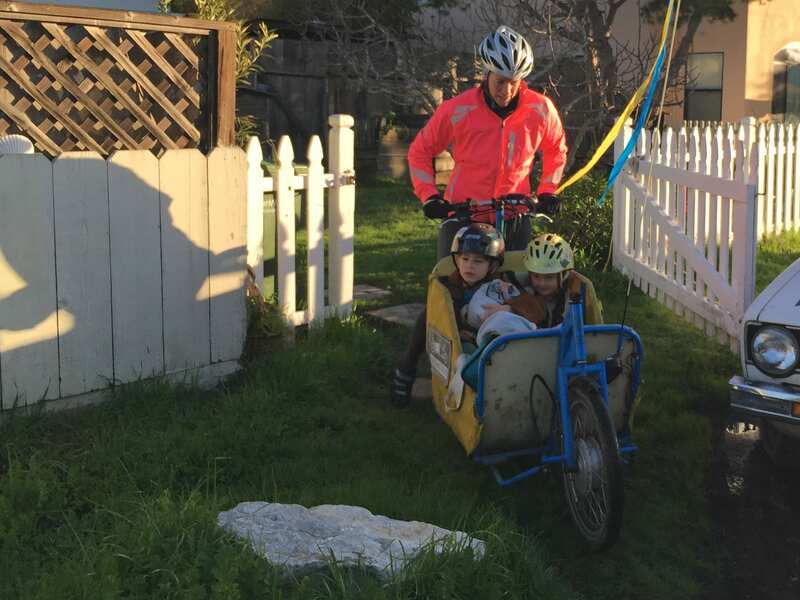 The founder Alex and his wife Kelly use their bikes to deliver their two children to school each day and get to work. 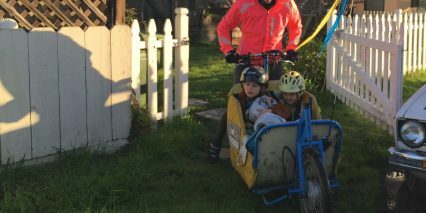 It’s pretty awesome to see and even though it may not be possible to do year round in every locale (especially if you live where it snows a lot) it can work at least some of the time. 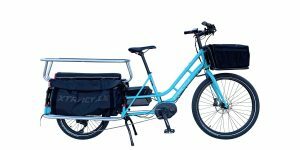 The big hurdle with this and any box style bicycle is that the steering mechanism and front wheel are positioned way out front. 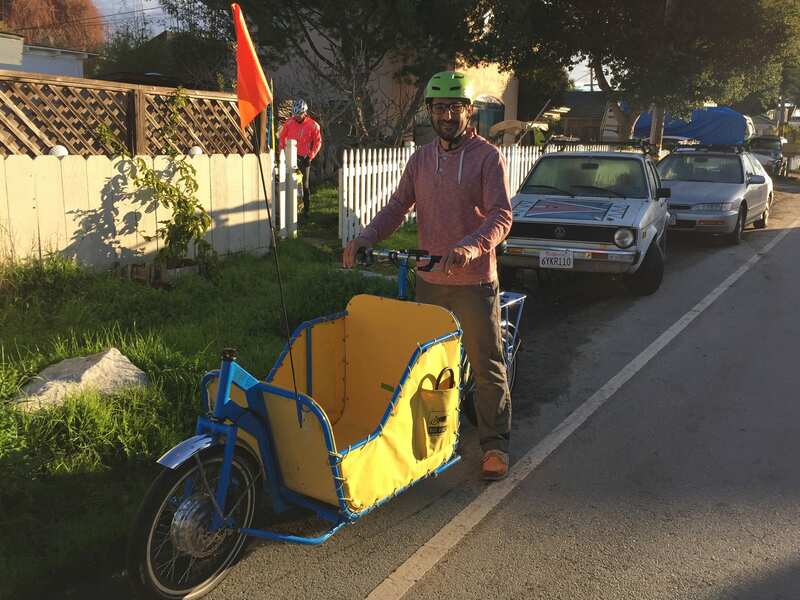 It takes some getting used and definitely more balance to start out. 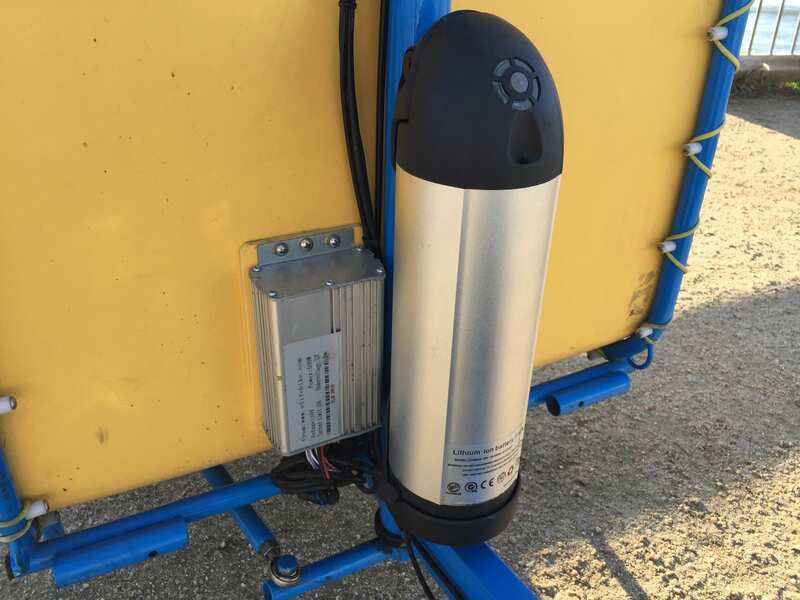 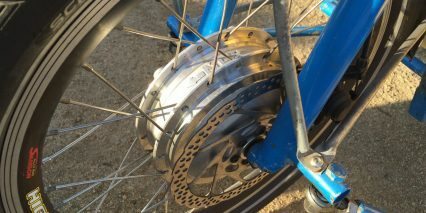 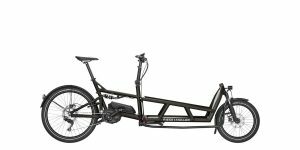 The smaller 20″ wheels used on the Standard Box Bike keep weight low and stable and allow the 500 watt motor to operate efficiently. 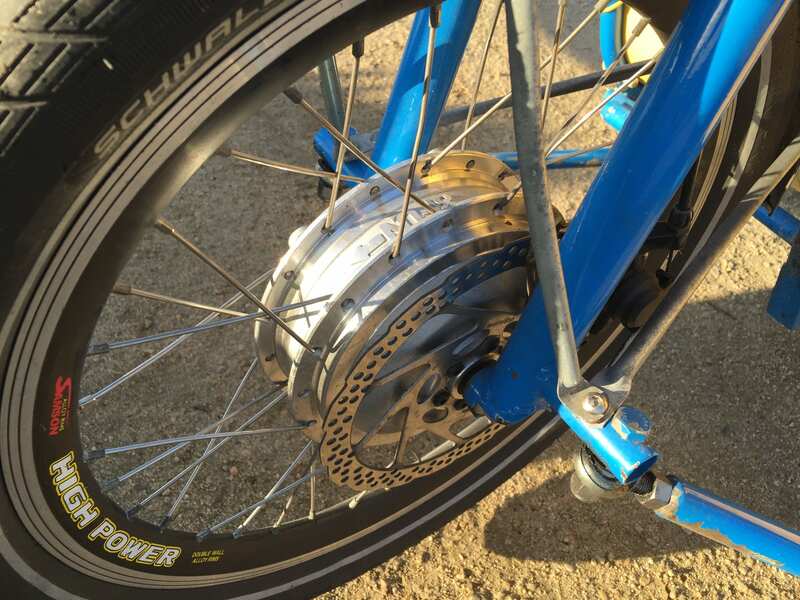 As the rider, you’re turing a 20″ rear wheel, benefitting from the same mechanical advantage, and the nine speed drivetrain is plenty for climbing or hitting 20+ mph even though the motor cuts out at ~17 due to the smaller diameter and built-in limiter. 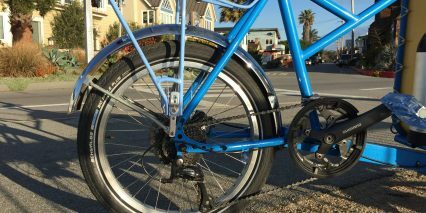 Because the saddle is oversized, the tires are extra wide at 2.15″ and the steel frame is forgiving and vibration dampening this ebike actually rides very comfortably but it is flexy. 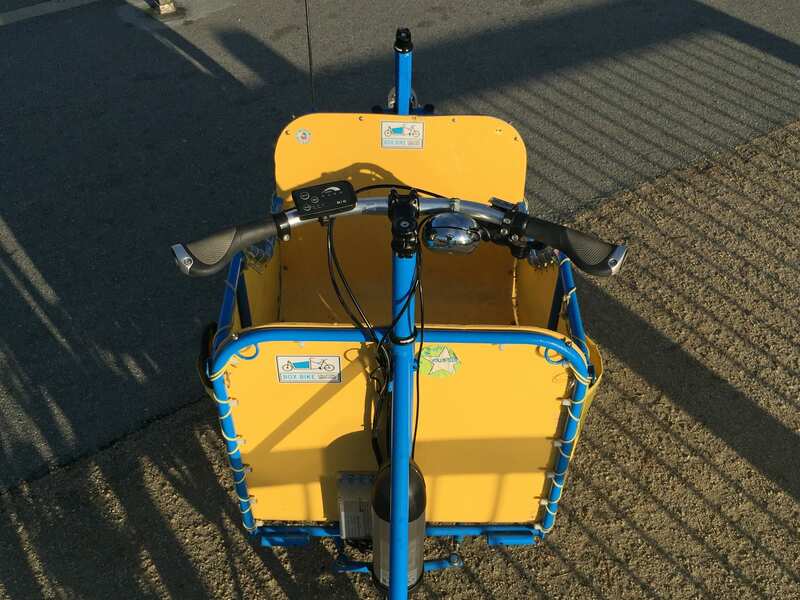 Especially when starting out I found that it jiggled and my turning motions weren’t immediately transmitted to the balance of the bike… this is what I mean about getting used to it. 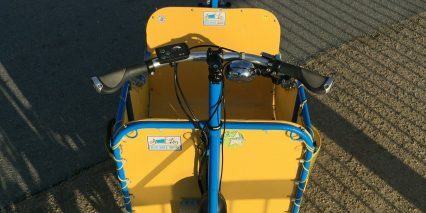 With a bit of speed (usually under pedal power only) the whole bike calms down and you’re off. 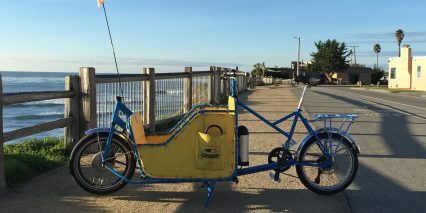 The Box Bike Collective is many things to many people but the bike itself is more of a niche offering. 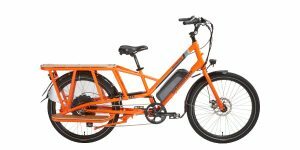 Having tested other similar products like the Urban Arrow Family with similar motor, battery and weight specs I missed the rigid frame for starting and balance but enjoyed the comfort gained. 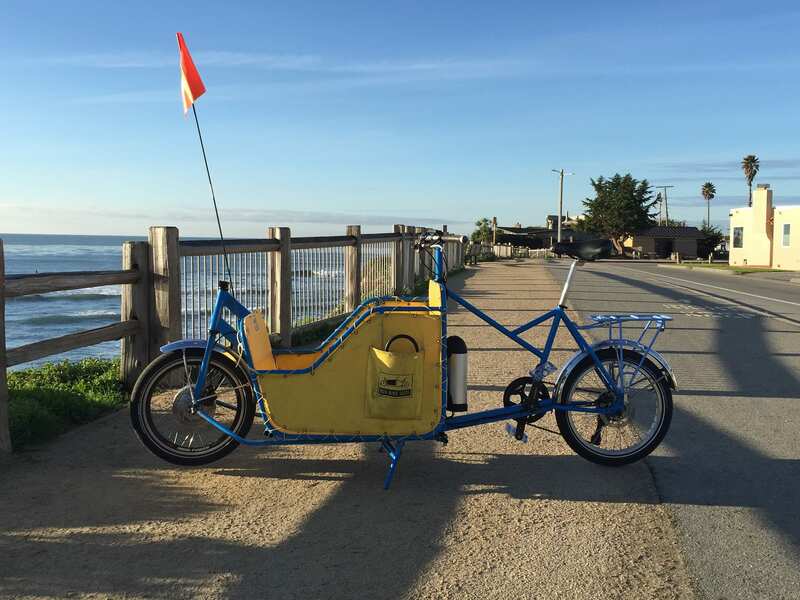 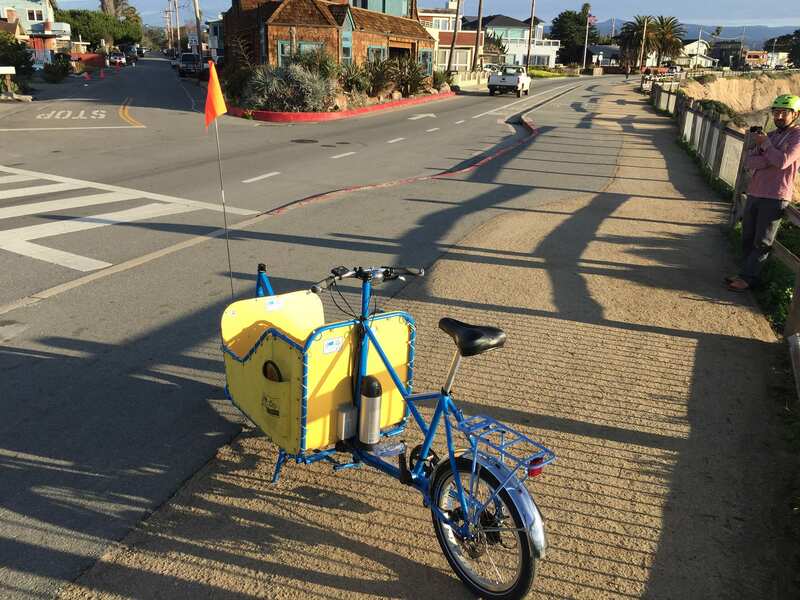 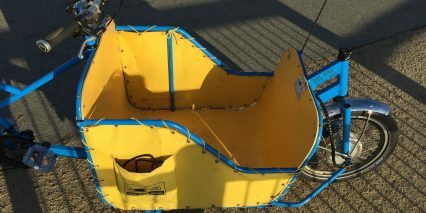 The bright blue frame, yellow basket and orange flag reminded me of my own childhood riding in a burly trailer and I loved the additional tube slots along the side for use with surf board racks or long pieces of hardware. 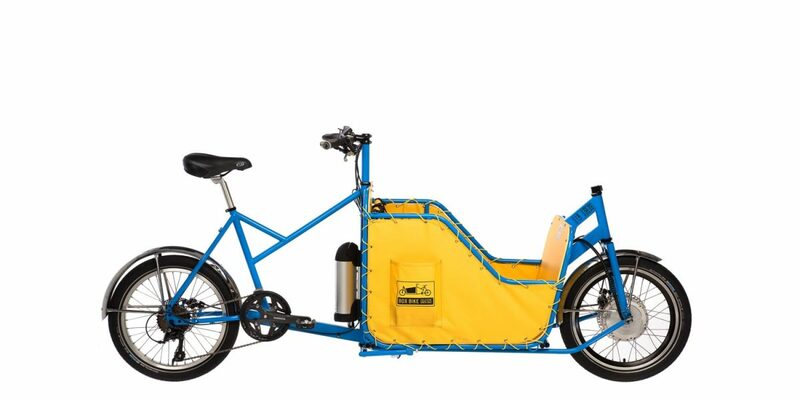 This is a useful bike, like a fun little pickup truck that rarely brakes down and comes in handy in different ways for each member of the family. 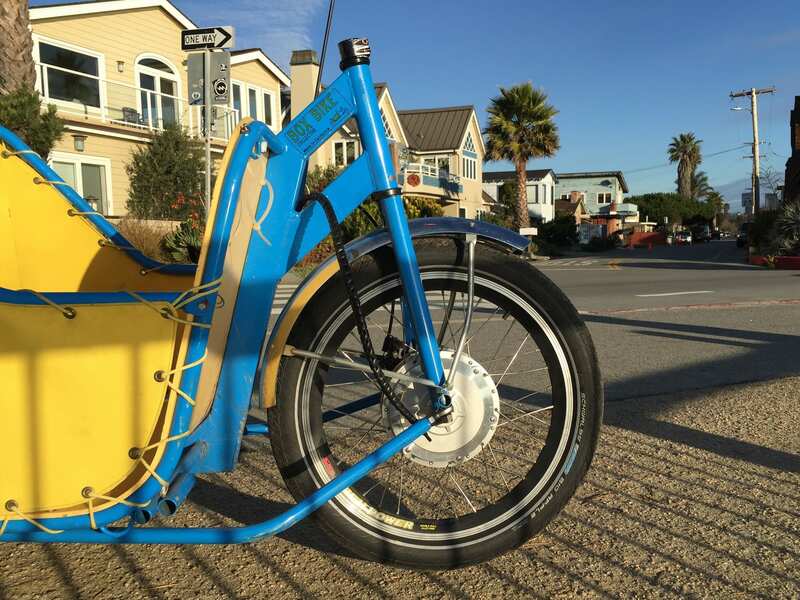 I love that Alex can offer a bit of customization and that he’s already working on an upgraded model to compliment the standard.